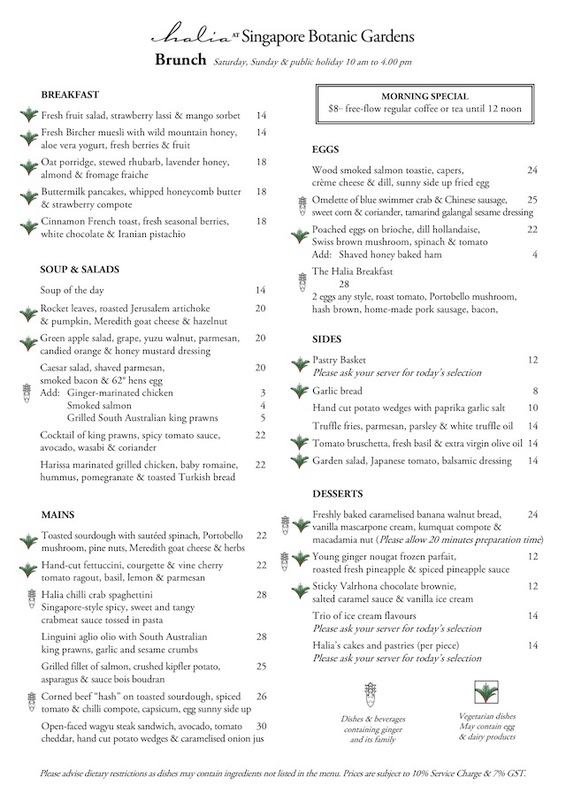 Here's the simple one-page menu for brunch, which is available for weekends and public holidays 10am to 4pm. As you can see, prices range from $14 to $30, averaging around $25. That is pretty fair considering the location and establishment. Probably a good place for special brunches once in a while. So, we embarked on our brunch journey with my favorite from Halia, the ginger (halia) tea ($10). This time round I got the warm one as we were sitting indoors. Can't get enough of that warm spicy kick. For appetizers, we had the King prawn cocktail with spicy tomato sauce, avocado, wasabi & coriander ($22). It was like the anti-thesis of what cocktails normally do to you because this is refreshing and nourishing. I really liked the tang from the fresh tomatoes and the juicy bouncy prawns. Coriander, not so much. Next up, perhaps one of the group's favorite for the day (and something I would order again when I go back) - the Cinnamon French toast ($18++) with fresh seasonal berries, white chocolate & Iranian pistachios. It was so good! I suspect it had to do with the fluffy bread beneath all the berry goodness, as well as the white chocolate sauce. A super cheery breakfast on the plate, that's what it is! Next up, one of the default items that one MUST order to gauge a brunch's ability to satisfy - the Eggs Benedict ($22). Don't you agree? It's like fried rice from a Chinese restaurant. Easy to make, difficult to master. There was a couple of poached eggs on brioche, dill hollandaise, Swiss brown mushrooms, spinach & tomato. And Halia definitely passed the test with their eggs ben. Look at the hollandaise! The brioche was also soft and yet solid enough to soak up all the murdered egg juice (yolk). Overall a solid representation of the chef. At this point we called for a half-time. It was already past noon and we have sampled the best of their breakfasts so it's time for more heavyweight items. First, switch drinks! I ordered an iced cardamom milk tea ($10), which was very agreeable. Out of curiosity we ordered a bowl of truffle fries ($8) to try, because really, who can resist truffle fries? To my delight they were fat fries, which I absolutely adore. I don't really like crispy skinny fries (like Long John's) - I prefer them MOS burger style, fat soft and full of potato flavour. These fit the criteria and comes with truffle. Yum! Last but not least, in the savoury mains category we have the perennial star of Halia - the Chilli Crab Spaghettini ($28) with sweet and tangy crabmeat sauce tossed in pasta. The always generous chunks of sweet crabmeat was heavenly. This might just be one of the best ways to eat crab, for someone who is too lazy to feel from the shells! We are left with desserts. The first was sticky Valrhona chocolate brownie ($12) with salted caramel sauce & vanilla ice cream. I did not expect the brownie to come in that flat compact form, which was great for someone who's already quite stuffed. Not overly indulgent by sight, but big on quality chocolate taste! Last but not least - one of the best desserts I have tried this year. No really, I am serious. I was so blown away by thie caramelised banana walnut bread ($24) with vanilla mascarpone cream, kumquat compote & macadamia nuts. You guys. need. to. go. try. Sleeper hit. Crept up behind me and gave me a blow. To my tastebuds. Exclaim! It was that warm banana walnut bread with the crunchy caramelized nuts and bananas. The cream lifted it up. The bread envelops you like your grandma's embrace. The kumquat compote was a bit extra, to be honest. The rest was amazing enough. Here are my lovely dining companions. Esther, Dawn, Calvin and Edsmond. Great brunch place you need to bookmark for future reference. Go for their french toast, eggs ben and banana walnut bread. Of course, don't forget to take a leisurely stroll around the Botanic Gardens to get to Halia, or after brunch to digest. From 5pm to 630pm daily, only drinks will be available. Thanks to FoodNews PR and Halia for the delicious brunch invite!